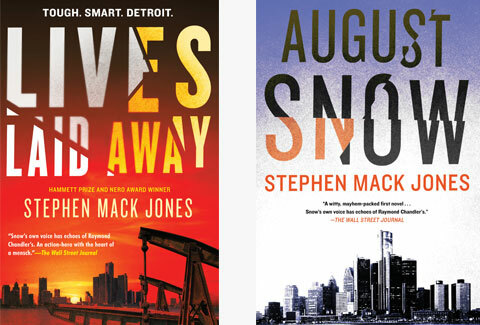 Award-winning author Stephen Mack Jones published his second book featuring Detroit ex-cop August Snow this week. Lives Laid Away is a “clever, punchy tale,” with unforgettable characters and a plot that drives at full throttle. Last year, Jones’ debut, August Snow, was a smash hit, so anticipation for the follow-up has been high. He spoke with Publishers Weekly in November about Detroit and his protagonist and the cultural ramifications of the book’s setting. You’ve said that places can become distinct characters—how would you describe Detroit as a character? Beaten up, bloodied, one eye nearly swollen shut, still standing in the 10th round, with the other guy’s blood and sweat dripping off his gloves. Has he hit the mat a couple times? Yeah, sure—but never for a full count. He always gets to his feet, looks at his opponent, smiles, and says, through a cracked mouth guard, “That all you got?” That’s how I’d describe Detroit. Beaten, but never beat. What are the biggest misconceptions about Detroit? That the city is nothing more than crumbling ruins with the characters from Mad Max running through the streets. The truth: the city is vibrant, colorful, cutting edge, and getting better every day. Yeah, there’s a lot of work yet to be done, but that’s true for any city, right? And while racial misunderstanding and animosity still exists, this is a city where diversity is real and strong, flourishing and bearing fruit. In what way would your novels differ had they been set in other urban neighborhoods with people of mixed Mexican and African-American heritage, such as L.A.? How did you name your lead? I’d love to tell you that August Snow’s name was born of strenuous intellectual labor and a considerable investigation into the dichotomy that exists in his soul and ethnicity. But the truth is, his name came to me while I was mowing the back lawn. At one point, the words august and snow settled on my mind, and I laughingly dismissed them. Two weeks later, the words were still there, stuck like thistles to my brain. I decided I had to do either of two things: 1) seek psychological therapy or 2) write a story with those words. And since writing is therapy without the expensive co-pay, that’s the way I went. I had a basic outline of the first August Snow novel, only I didn’t have a name for the hero. In fact, in the outline, he was simply known as “hero.” And that’s how the baby got named. Purchase the book in either hardcover or ebook directly from the Soho store and receive 15% off the paperback (print or ebook) edition of August Snow. Use coupon code #SnowX2 during checkout. It’s a win-win and only available for a limited time! Go here to grab your copy today.